Just when our online world seems to be getting safer, we get hit with yet another rogue. This time Major Defense Kit is attacking innocent users worldwide. It is best to full be aware of all of the signs and symptoms in order to be able to effectively remove Major Defense Kit upon immediate detection. 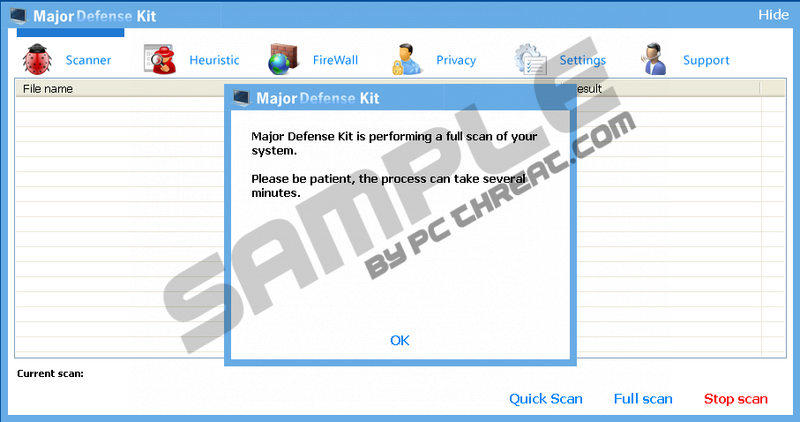 Major Defense Kit is part of the plan which the fake Microsoft Security Essentials Alert makes use of. Major Defense Kit is a major problem for everyone everywhere. Major Defense Kit will never defend your computer system in any way, shape or form. The opposite is guaranteed to take place and your computer system may become completely destroyed. Major Defense Kit is powerful and is able to turn the computer system you once loved into a machine that is unrecognizable. People all over the world are struggling with removing Major Defense Kit from their systems right at this very moment. Major Defense Kit is very dangerous and is never to be trusted. The truth of the matter is that precautions need to be taken in order to never be at the receiving end of this dangerous rogue Major Defense Kit. Major Defense Kit is going to harm users all over the world if steps aren\'t taken in order to remain safe and Major Defense Kit free. Quick & tested solution for Major Defense Kit removal. press CTRL-ALT-DEL to enter the task manager. "end task" (or kill) the running application of Major Defense Kit. Then press NEW TASK. type in "explorer.exe" and then press OK. Your desktop should load properly and you can then run whatever anti-virus program you like.